The entangled secret that contained in the name of main characters in MBC TV drama series The Moon Embracing the Sun in original novel is attracting everyone’s attention. The MBC TV series The Moon Embracing the Sun is adapted from a same-name fantasy novel that contains the fictional story is different from real history, mixing with trendy materials to attract audience. 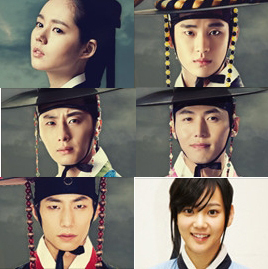 Particularly, the title of The Moon Embracing the Sun implies the name of the main characters in the drama, Hwon (Kim Soo Hyun), Wol (Han Ga In), Woon (Song Jae Lim), Yeom (Song Jae Hee), and Seol (Yoon Seung Ah) actually contain the secret of their own fate. Firstly, the Hwon who born with the status of a king has the meaning of sun, while his partner Wol has the meaning of moon, similar the theme title, the hinting on the fate of two people that cannot be broken. When she was small, the name of Wol is Yeon Woo, which literally means misty rain, and it’s really like a drizzle fine rain, implicated the fate of Yeon Woo who disappeared in a flash, and including the mournful feelings. Then again, the Woon is literally mean cloud, which exists by the side of sun and moon in the sky. In the drama, Woon stays by the side of Hwon, existing as the linkage to Wol, the meaning of his name speaks for itself. Seol who has a wide gap in status and whose name has the meaning of snow, can only admires Yeom whose name has the meaning of fire. The meaning of the names hints on their sad love. In the original novel, just like the fate contained in their name, Seol sacrifices herself for Yeom. As to how the drama will play out the scene is highly anticipated. For the meaning of the name of main characters in The Moon Embracing the Sun, netizens said, “Sure enough every Hanja has a secret,” “The name of heroes and heroines really special” and so on.